Your private driver from Italy’s Best will pick you up from your accommodations to begin your journey to the Paestum Plain, which sits beside the River Sele. Along the way you’ll see the sea on one side and the Alburni Mountains on the other. In the center, sits Paestum archaeological park enclosed within a wall that was built by the city’s first inhabitants for protection. 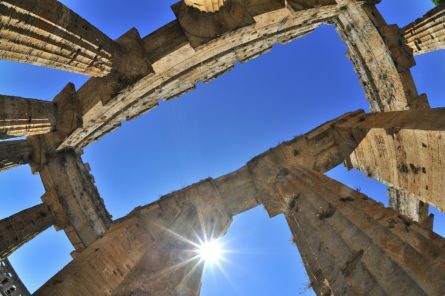 Your expert will guide you on a private Paestum tour to help dissect the monuments. Paestum, originally known as “Poseidonia”, was founded between the 7th and 6th century B.C. by the Ancient Greek colony of Sibari. Some centuries later, the town was taken over by the Lucans, who were then subsequently ousted by the Ancient Romans who enlarged the city, constructing thermal baths, a forum, and an amphitheatre, but left the city’s sacred area exactly as they had found it since they were so struck by its beauty. Paestum’s perfectly conserved temples and massive Doric columns continue to awe visitors. The two temples dedicated to Hera and Neptune tend to steal the show as they’re widely considered the world’s finest surviving example of Doric architecture. The remains of the Roman forum are the built on the site of the Greek agora and sit in the center of the archaeological park. No trip to Paestum can be considered complete without having visited the National Archaeological Museum to see its precious artifacts from statues to ornate funereal garb. The Diver’s Tomb exhibit contains a grave made of five painted limestone slabs including depicting a young man diving into the sea, a compelling example of Hellenic painting has remained intact for more than 2,000 years. Following the park, your driver will bring you to an exclusive mozzarella cheese producer for a private tour! We are all familiar with mozzarella –that creamy, melt-in-your mouth cheese. Get a truly authentic Italian experience by discovering how it’s made and learn the secrets and tricks of the trade along the way. Stroll around the estate to see the buffalos while you learn about artisanal cheese making. You’ll have a hands-on lesson as to how to make mozzarella then enjoy a tasting of milk and mozzarella- based products produced at the farm. This half-day tour to Ostia Antica takes in the splendid ruins of this ancient Roman port town. Often called the ‘better Pompeii,’ the site is filled with mosaics. Here it’s easy to let your imagination fly and feel like you’ve been transported back in time – in this once bustling Roman harbor town the isolated ruins reveal no sign of the modern world so you’ll have a truly authentic experience! Enjoy the highlights of the city in this Naples private tour, designed to orient you to the city in the company of an expert guide. Bask in the VIP experience of this Capri boat tour. Disembark and enjoy the town or go for a relaxing swim and bask in the sun at the secluded bays. Admire the famous Faraglioni Rocks, the magnificent Blue, White, Green Grottoes, and more!